One of the many Labyrinth cast. ... and wood nymphs; cavorted with barechested Pans and gorgeous Green Men; and a very handsome unicorn... no? Well, read on my luvlies! 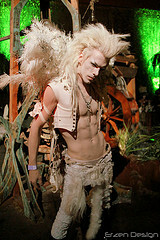 The night of the Labyrinth of Jareth Fantasy Masquerade Ball was a blur of fur and feather, a melange of metal and music. The unicorn was pretty chatty too, though I could be remembering the towering oak tree that leant his oak branch against the wall above my head while adjusting his trunk. What a night...what a feast for the eyes and soul. Each year for one magical night in July, the sultry, summer evening unfolds to reveal the most fantastical creatures and creations. Artistry and imagination runs wild among the seemingly ordinary, the guy you stand in line behind each morning at Starbucks is dressed quite casually in furry knickerbockers and hooves, with happy horns peeking out of his nifty quiff. On that once a year evening of enchantment you find yourself ardently explaining how long to let body latex cure before you should spray yourself head to toe silver, and always, always apply the metal talons last. Does this already sound familiar? Have you explored your inner Pan, let your fairy child fly free or given yourself over the the dark side of your darkest fantasies? Yes? Then you most certainly have your tickets for this year's Labyrinth of Jareth Fantasy Masquerade Ball propped up on your mantel piece, with fairy wings freshly unfurled and hanging on the back of your closet door ready to join the Faerie Court. No? Then let me enlighten you. Fantasy really does become reality for one dreamtime inspired night in downtown L.A. In it's 14th year the Labyrinth of Jareth annual costumed event is where Celtic myth and faerie lore share the dance floor with ruffles, corsets, ballgowns and homages to Hollywood and fantasy film, losing themselves to decadence. It's an experience for the adventurous and those seeking to be adventurous. Once held at the Music Box theater and now at the historic Park Plaza, it has a huge following and it's said that celebrities attend, disguised and almost impossible to recognize among the myriad of costumes and masks. I dare you to corset up, get your steam punk on and join the artists and characters of the Faerie Court - make haste though, it's on July 1st and 2nd!